A few drips from a faucet may not seem like a big deal. It might be a slight annoyance. But you might be willing to overlook a few drops of water. Unfortunately, a leak is not just an annoyance. In fact, it can lead to quite a bit of damage to your house. Here are just a few ways that a small leak can leave some lasting damage. One of the first concerns you may have about water damage is the possibility of mold. Mold and fungus thrives in moist to grow, and when you have a leak, you are giving it the ideal opportunity to flourish. Mold creates spores that can get into the air and can lead to some serious health concerns. Most people will have irritation of the lungs, but it can lead to even worse conditions. Most children that grow up in mold-infested homes will also develop asthma. The cost to get mold removed can be anywhere from hundreds to thousands of dollars. Moisture can warp and damage your drywall. If left for a more extended period it can lead to structural damage in your house. A small drywall repair job can run you as low as $400. But if more drywall is damaged, it obviously will cost you more. You can tell that the flooring has some severe water damage when it starts to buckle and have bubbles under it. If you are looking to replace a square foot of flooring, it can run you anywhere from $12 to $35 for that one bit. But if there is damage to the floorboards then replacing them can be around $1000 or $1500. 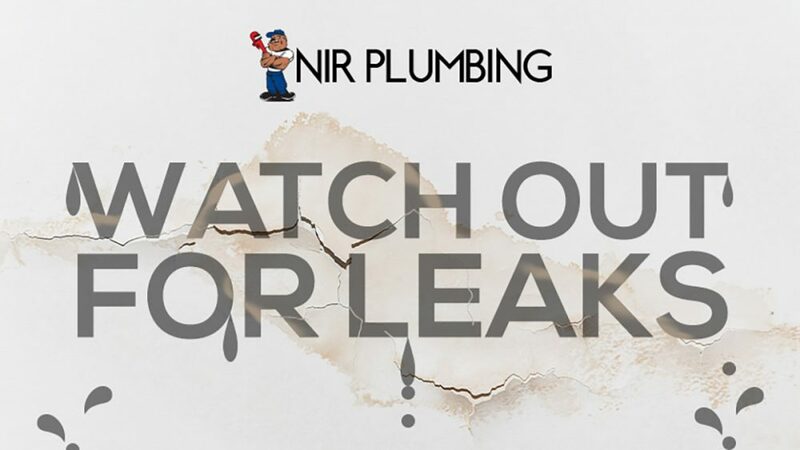 If you think that you may have a leak, please contact us at NIR Plumbing. We can help you before it leads it any severe damage. Please call us for all of your plumbing needs.